A new documentary on the Black Panther Party overlooks the group’s socialist core. In the modern American memory of the 1960s, the Black Panther Party is presented in three images. First, and perhaps most pervasive, is that of a violent organization of angry African-American men and women — the people who marched on the California State Capitol Building in 1967 and wielded weapons during encounters with police. This perception of African Americans, armed and dangerous — a callback, in some ways, to the fear of slave uprisings and later, black political rule in the South — sparked demands for law and order across the nation. The second image of the Black Panthers has been cultivated by activists and modern historians alike: an organization dedicated to local community activism, building political power, and delivering social services to those who needed it most. Seen in books such as Alondra Nelson’s Body and Soul: The Black Panther Party and the Fight Against Medical Discrimination, this version of the Panthers renders them armed not just with rifles and bullets, but with medicine and food. 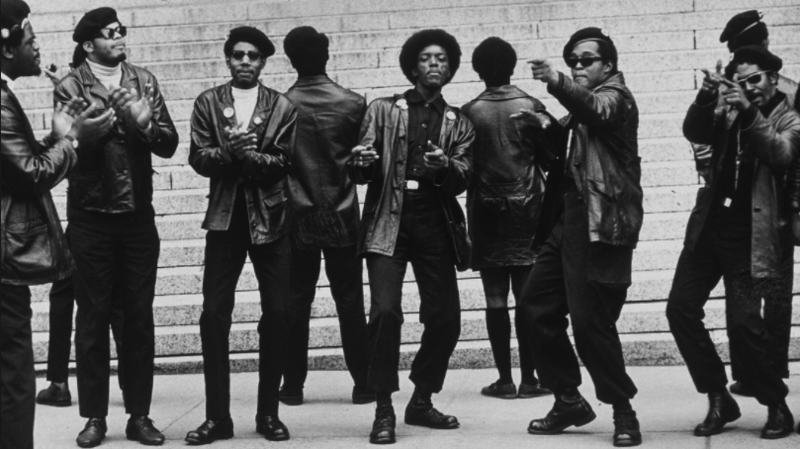 A new documentary titled Black Panthers: Vanguard of the Revolution excels at discussing these first two images. It’s less adept at covering the third: an organization built on socialist principles and ideology. The Black Panthers’ “Ten Point Program,” put forth in 1967, outlined the party’s basic precepts for a wide audience. Economic progressivism, long an important part of the twentieth-century African-American freedom struggle, pervades the document. Point two, for example, advocates full employment for African Americans, and the following point demands “an end to the robbery by the capitalists of our black and oppressed communities.” Erasing this element of the Black Panther Party’s history — or even downplaying it — distorts the reality of not just the Panthers but the black freedom movements of the period and the US left more broadly. By 1966–67, activists who had been involved in the Civil Rights Movement were beginning to think about the best course of action in a post–Civil Rights Act and Voting Rights Act America. Conservative backlash was already in the air. Ronald Reagan was making considerable headway with voters by calling for “law and order,” and George Wallace was perfecting his racial dog-whistle appeals to white voters. At the same time, the Left — troubled by Vietnam and the Cold War abroad, and the crushing limits of economic and civil rights reform at home — was galvanized by the BPP’s iconic imagery in national media. Some of this was out of stylistic attraction. But more importantly, the affinity was borne from a sense that the Panthers were the most trenchant critics of American racism, imperialism, and economic exploitation. Indeed, the BPP was part of a larger radical tradition, beginning with the black left but extending well beyond its boundaries. Vanguard of the Revolution fails this basic history test. While the documentary briefly mentions the group’s opposition to capitalism, it’s not nearly enough to explain socialism’s import to the BPP. The documentary’s focus on the powerful, larger-than-life figures of Huey Newton, Eldridge Cleaver, and Bobby Seale, though understandable, also muddies the water. By treating the fissure that developed between Newton and Cleaver as personal rather than ideological, Vanguard misses an opportunity to explore the fault lines of the Panthers and the black left more broadly. Likewise, the documentary says little about the larger trends among African-American intellectuals in the early 1970s, when debates between pan-Africanist and Marxist-Leninist factions doomed attempts at African-American solidarity. The movie’s inclusion of Fred Hampton indicates the filmmakers did have some awareness of the BPP’s anticapitalist hue. As the leader of the BPP’s Chicago chapter, Hampton attempted to foment a cross-class, cross-racial movement against capitalism. His personal slogan — “I am a revolutionary!” — energized thousands, and his appeals to poor white residents in the city’s slums belied the image of the Panthers as a “hate whitey” organization. Hampton’s assassination in 1969 at the hands of the Chicago Police Department marked a turning point for not just the Black Panthers, but the still-developing Black Power Movement. His death, along with those of Malcolm X and Martin Luther King Jr, both strangled the potential of the African-American freedom struggle in the late 1960s and crippled the black radical tradition. This tradition, encompassing a range of movements for social equality and including intellectuals from W. E. B. Du Bois to Cornel West, witnessed both its greatest moment of triumph in the 1960s and some of its most devastating setbacks. Vanguard of the Revolution captures some of this, but without an adequate understanding of the ideology and traditions from which the BPP sprang. Omitting the BPP’s anticapitalist foundation, the movie leaves viewers with a bowdlerized picture of the Panthers that draws an unnecessary line between concerns about race and class. No one film or book can provide the complete history of the BPP. And Vanguard of the Revolution is in many ways a beautiful and moving film. But for leftists and radicals today, understanding that the intellectuals and leaders of the BPP took Marxism and cross-racial coalition-building seriously is an important lesson to remember — and be inspired by.